A video on the Siam Chon news sight featured a South Korean restaurant owner - clearly drunk - who was arguing with officials after allegedly causing a serious accident in South Pattaya. It has been claimed that he was going the wrong way down the street. One man is in a coma and two are in hospital with broken legs. The motorcycle they were on had "police plates". Pol Capt Sombat Kaewmoonmuk responded with rescue services to the accident by The Rich Home at 3.30 am this morning. At the scene was a black Ford Fiesta (Bangkok plates) with its front smashed in. A "red police plate" black Yamaha Filano motorcycle was destroyed and on its side. One man was in a coma with grievous injuries. A woman had two broken legs with the bone protruding on her right leg. Another man had hit his head and broken his right leg. Mr Park Sunghee, 50, the driver of the Fiesta was arguing with police in broken Thai at the scene. Siam Chon said he was very drunk - a reading of 127 milligrams showed he was well over the limit. 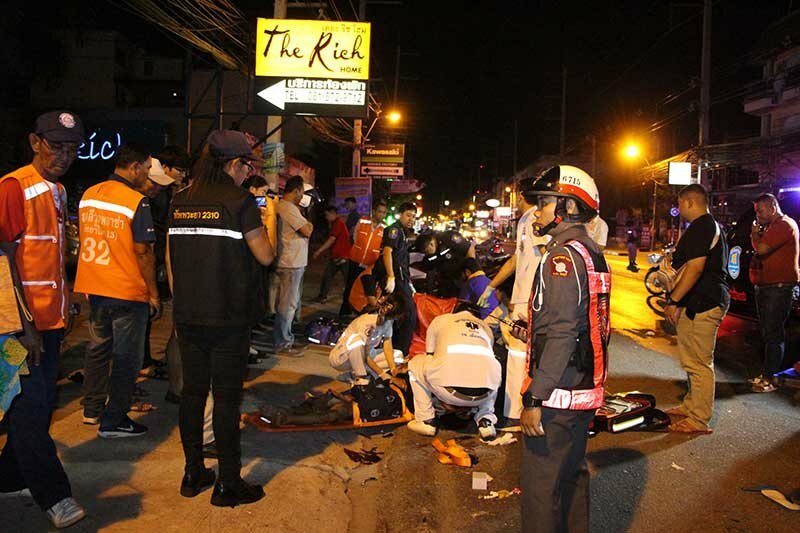 Motorcycle taxi rider Ranong Fansungnern, 52, said he saw two bikes proceeding along the road as normal before one drove back. When he next looked up the other bike that had gone straight on had been hit and there were bodies all over the road. Siam Chon said in their headline that the Korean - a restaurant owner - was going the wrong way down the road. Do they also drive against traffic in Korea or did he learn that from the Thai? Look at the traffic, why is nobody wearing a helmet? Oh wait, it's pattaya...solly..
Again. Looking at the state of the vehicles, regardless of what happened you can safely say excess speed was involved. The question remains: Will they ever do anything positive to deal with the idiocy we see constantly? Unfortunately I think not. This Korean should be force fed with alcohol until he drowns in it. some very grievous injuries to the motorbike riders. I think a bottle of Jack taught him that. It's a hell of a lot safer in that desert than here. Drunk and recorded , insurance invalid , liable for all medical fees of all injured , loss of work, pain and suffering , property damage . I hate to say this but the authorities should be held in part responsible, after all they did report that going the wrong way along a road and failing to stop at a red light were only minor offences....!!!!! Do they also drive against traffic in Korea or did he learn that fro gom the Thai? A wish for a speedy recovery to the injured might be more in order! Or would that not be so cool? "The motorcycle they were on had police plates" - Glad I am not a Korean, glad I am not a restaurant owner, glad I am not drunk, glad I am not going down the wrong way on a street. Most of all though, I am not too glad about the outcome if those are police plates! Well done that prick! go to jail go directly to jail do not pass go and do not collect 200 pounds! You mean not into oncoming traffic?